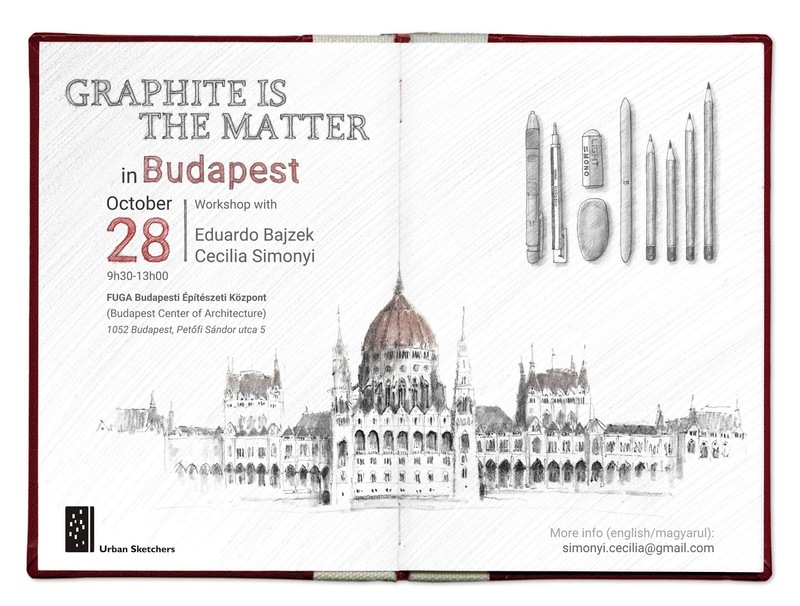 On October 28, I taught the workshop "Graphite is the Matter" in Budapest, as announced. I have plenty of stories and drawings to share about my recently trip to Hungary, but I'm starting with this workshop. The workshop was planned by me and the local artist and friend Cecilia Simonyi. 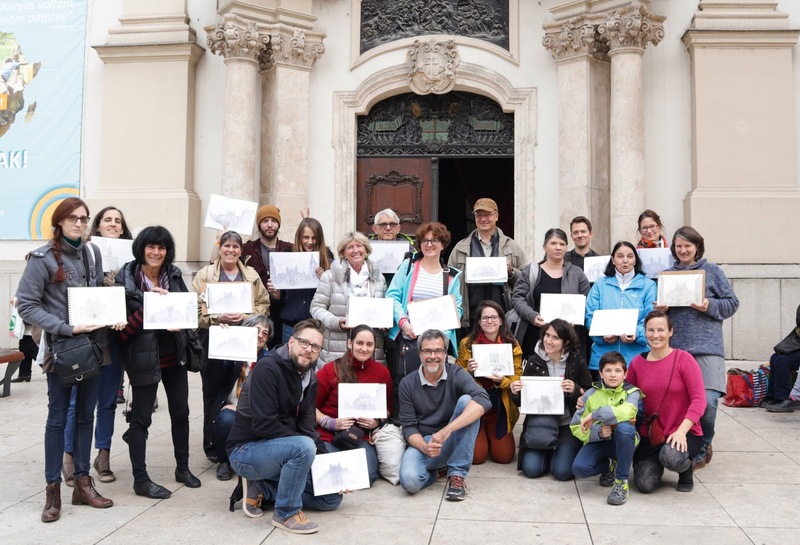 It was approved as an official Urban Sketchers workshop and it also had local support by Usk Budapest. The workshop location, at Kossuth Lajos U and Ferenciek Tere, was a great choice. It had some interesting subjects for a painterly approach with graphite. I went to the spot twice before it happened to study the location, its subjects, possible angles and alternatives in case of rain. On the first day, the weather was challenging. It was very cold and wet, which forced me to work quickly and to stop for a coffee nearby. At least, I was relieved as I noticed the existence of a loggia where we could be sheltered in case of bad weather on the day of the workshop. I came back on the the next day. As the weather improved, I worked peacefully on a few pieces for the demos. I could finally feel well prepared - it was the same feeling of teaching at an Urban Sketchers symposium. On Sunday morning, the day of the workshop, the weather was just perfect for teaching and drawing. I started talking about my own work, about urban sketching and the Urban Sketchers organization itself. Cecilia assisted me, and did the translation to Hungarian. Then, I did a quick demo showing the first exercise, taking the opportunity to talk about the materials and pencil technique themselves. Everyone seemed to grasp the idea of working with masses, looking at the whole visual mass of the subject, trying to avoid doing contour lines. After everyone finished I did another quick demo showing how to proceed next. I remember some participants asking what the "next steps" were. I showed then how to keep focusing on the masses, improving the general composition whilst adding smaller shapes for windows, doors, building ornaments, people and so on. At the end, we put all the drawings on the ground and shared the impressions of the technique, approach and results. People were happy with the experience and so was I! I honestly believe it was one on the best workshops I've ever taught. It was very productive and the group was eager to learn and to try this approach. For me it was really special teaching at Hungary, the country where part of my family came from! I'd like to thank Cecilia for her assistance and to help me making this workshop happen. 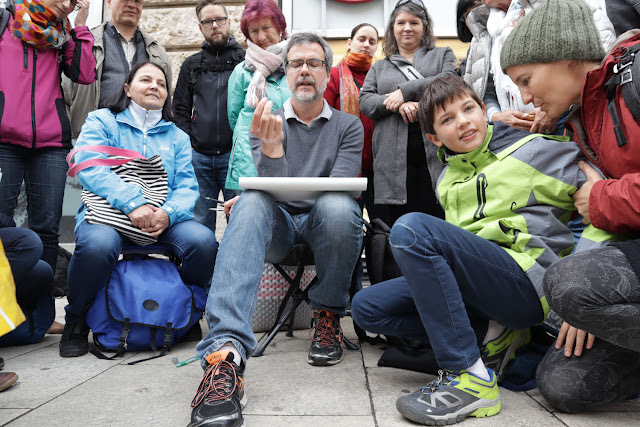 I'd also want to thank Urban Sketchers and Urban Sketchers Budapest! Get to know the beautiful work by Cecilia Simonyi on her website and Eduardo's work ion his blog.